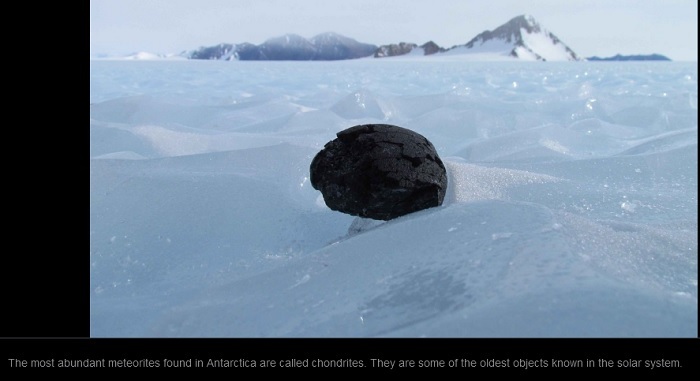 The Antarctic Search for Meteorites didn't glean as many meteorites as hoped during the , but still came back with hundreds of specimens — and photos. Antarctica is one of the best places on Earth to spot these fallen stars. Each winter — which is summer in down south — camps out on an Antarctic glacier in the middle of nowhere, often where no human has ever tread. It's kind of like a space voyage, but a lot cheaper. And it's the meteorite that's done most of the traveling. "It's an amazing journey to think about, and a very precious rock," says Jani Radebaugh, a planetary scientist at Brigham Young University, from a tent about 500 miles from the South Pole. She's one of eight in an expedition group funded by NASA and based out of Case Western Reserve University. Each day, she and her team members set out on snowmobiles, scanning the horizon for black specks — samples that will eventually make it to NASA's Johnson Space Center in Houston. Most of the meteorites have been since they landed on Earth millions of years ago. 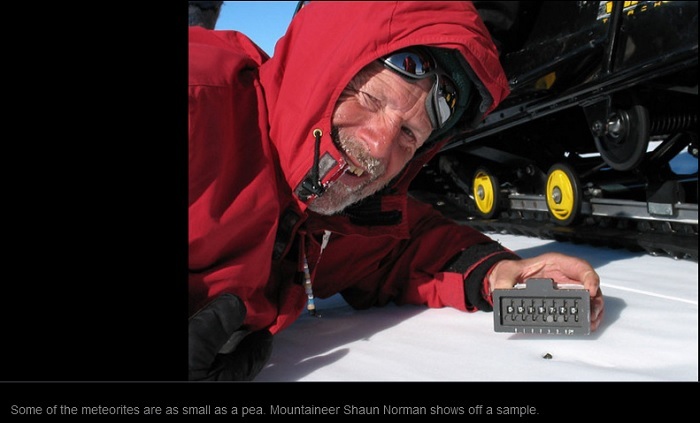 The glacier keeps them fairly sterile, preserving the specimens almost as a deep freezer would. And the white-and-blue expanse gives a good backdrop for the search, which is a little like looking for an ant on a white tablecloth — if the tablecloth were million-year-old, mile-thick blue ice. "As soon as you see that dark black fusion crust on the outside, you just get so excited," Radebaugh says. "Everyone jumps up and just starts waving their hands." 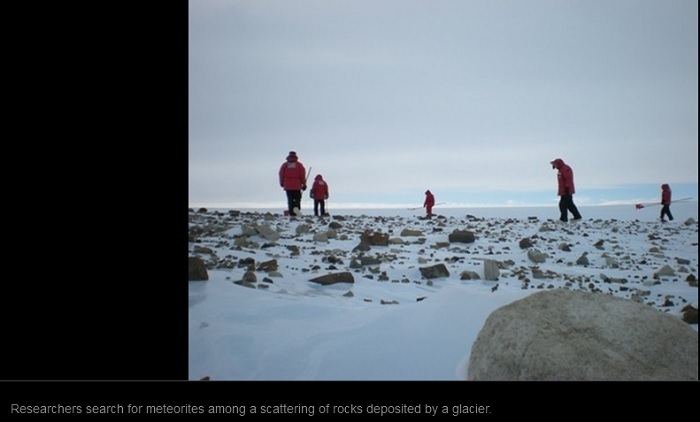 Then, they drop to their knees to measure, photograph and collect the meteorite. They get excited because these rocks can offer precious information — like clues about the early solar system, and whether there was ever life on Mars. The meteorite hunters are a hardy crew. Sleeping on a creaky slab of ice hundreds of feet thick can be a bit unnerving. "The only thing I can hear is the popping of the glacier underneath me," Radebaugh says. "You're sitting on a giant, moving body of ice. And sometimes you forget that, until you hear the pops and groans. It's really magical." Radebaugh and her colleagues will spend close to two months out on the ice, one group of a long line that has collected more than 20,000 meteorites in the last few decades. This year's expedition is a little different from past years. It's a lot shorter — delayed by about a month because of the . Bad weather has prevented the other half of the eight-person crew from landing, despite efforts to smooth a landing strip on the ice for the ski-equipped planes. The team that is on the ground is doing its best, enjoying 24 hours of daylight and the thrill of finding chunks of other worlds. They'll celebrate New Year's Eve under the midnight sun, listening to the popping glacier, and perhaps dreaming about popping a cork.